Fierce winds that have fanned the flames of more than 14 wildfires raging through Northern California are beginning to die down this week. As of Monday, the fires had left 41 dead, 213,000 acres burned and 5,700 structures destroyed. 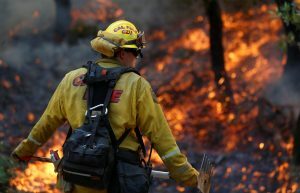 The California Department of Forestry and Fire Protection (Cal Fire) reported today that 11,000 firefighters are making headway against 15 fires in the region, down from more than 20 since the crisis began. Containment efforts are moving forward, with the Tubbs fire at 70 percent containment and Atlas at 68 percent. The fires began more than a week ago, igniting simultaneously and spreading quickly over long distances aided by gusty winds and dry, abundant ground vegetation. Start here: Cal Fire continues to spearhead rescue efforts across the region. This web page is regularly updated to show where donation and volunteer aid is most needed. Giving money is the most effective way to give to “ensure the right goods get to the right people at the right time following a disaster,” Cal Fire says. This Facebook page is dedicated to posts by those affected by the fires and those who wish to help. Residents and potential volunteers can post about missing people or pets and aid needs. You can find another similar page here. Airbnb is providing housing for relief workers and victims through their Open Homes program. Have space? Check out their Northern California Wildfire page. GoFundMe has a California fire relief page. California State Firefighter’s Association fund for fire crews who have lost their homes. Find them at Daily Journal, Napa Valley Register, Sonoma County Gazette and The Press Democrat. As always, it’s recommended do your own research to make sure your donations and time go as far as they possibly can in to reputable organizations. Visit Charity Navigator if you aren’t sure whether an organization is trustworthy. The California Attorney General has also included a page that can help advise potential donors and volunteers.